Painted Turtle Book, 9780814343654, 192pp. During the midcentury period, Michigan attracted visionary architects, designers, and theorists, including Alexander Girard. While much has been written about Girard's vibrantly colored and patterned textiles for Herman Miller, the story of his Detroit period (1937?-53)-encompassing interior and industrial design, exhibition curation, and residential architecture-has not been told. 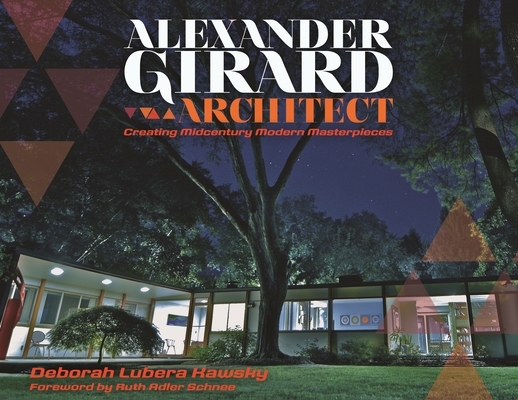 Alexander Girard, Architect: Creating Midcentury Modern Masterpieces by Deborah Lubera Kawsky is the first comprehensive study of Girard's exceptional architectural projects, specifically those concentrated in the ultra-traditional Detroit suburb of Grosse Pointe. One exciting element of the book is the rediscovery of another Girard masterpiece-the only surviving house designed entirely by Girard, and former residence to Mr. and Mrs. John McLucas. Restored in consultation with iconic midcentury designer Ruth Adler Schnee, the McLucas house represents the culmination of Girard's Detroit design work at midcentury. Stunning color photographs capture the unique design elements-including the boldly colored glazed brick walls of the atrium-reminiscent of Girard's role as color consultant for the GM Tech Center. Original Girard drawings for the building plan, interior spaces, and custom-designed furniture document the mind of a modernist master at work and are made available to the public for the first time in this beautiful book.